If one was pressed to name two entities in the sports world this weekend who improved their lot without lifting a finger, they’d be hard-pressed to come up with better answers than the college football playoffs and the Denver Broncos. Both went into the weekend with nothing to do but sit back and watch what the fruits of their labors would determine about their futures, and both had to emerge extremely pleased with the results. 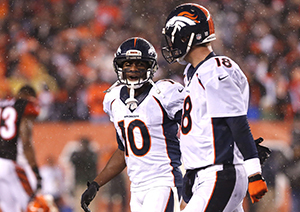 This must especially be the case for the Peyton Manning-led Broncos. Can there possibly be a better storyline than Manning’s former team coming to Denver, in a year where many have speculated that Father Time may indeed be finally catching up with the old field general? Will this be remembered as a measurement of Indianapolis Colts owner Jim Irsay’s decision to release Manning in favor of “The Next Big Thing” in Andrew Luck? Prepare to have these and other similar storylines wrung to the last drop. Sure, from an on-the-field standpoint, most would argue that Cincinnati would be an easier opponent for Denver. The Bengals barely squeaked by Denver at home in week 16 of the regular season, and between the monsoon that night bogging down Denver’s offense and the benefit of familiarity in a second matchup there was little doubt that the Broncos would avenge that loss easily. But behind the Bengals, there are very few teams that Denver would probably rather face than the Colts. Since week eight, Indy lost to the only three playoff opponents it faced – by a combined 135-61. Their defense is considered to be relatively soft and their offense, while potent at times, grew rather one dimensional as the season went along. Perhaps more importantly, the Colts aren’t the Pittsburgh Steelers. If Pittsburgh would have defeated the Baltimore Ravens on Saturday, Denver would have been their reward. And Denver would be getting a team that, after a slow start, managed to up their yards per reception average almost two full yards during the last two months of the season, while simultaneously unleashing one of the best running backs in the league in Le’Veon Bell. Hey, maybe their defense wasn’t quite up to Steel Curtain lore, but I’ve still not heard of many teams who have ever willingly wanted to play Pittsburgh in the playoffs. But most importantly of all, everything that happened this weekend was just gravy for the Broncos, because regardless of opponent, Denver simply needed to get healthy. Much has been made in recent seasons of teams ‘peaking’ at the right time. It’s not so much the most dominant team, but perhaps the one that comes together at the end of the season for six or seven games in a row en route to a Super Bowl victory. Perhaps that’s why that stat about six of the last nine Super Bowl winners playing on Wild Card weekend has been thrown around so cavalierly the past few days. But it doesn’t matter for the Broncos. Denver played games in 13 straight weeks leading up to the playoffs; and while they benefitted greatly as a team by running that gauntlet, they also emerged battered and bruised. The linebacker corps is in shambles. Key offensive weapons are visibly hobbled. Most people surrounding the team acknowledge that there are probably more players suffering on the field than we even know about. John Elway was probably foreshadowing a little more than he would have liked to be when he said over the offseason that the team couldn’t put all of their expectations on Manning. Whether you believe Manning is hurt, old age is catching up with him, or he simply made a few poor decisions on a few ill-timed throws down the stretch, it can’t be denied that this season hasn’t passed the eye test with the flying colors that 2013 did (I know, rich people problems, right?). That’s why Denver’s health will be so paramount to their Super Bowl run. After relative good health in 2012, last season was a nightmare, and it caught up with the Broncos against Seattle in the Super Bowl. With a makeshift offensive line, a starting running back that began the year with a tenuous status as No. 3 running back, and linebackers plucked from the practice squad, not only can they not afford any more setbacks, but they may need to get a few players back to actually seriously consider themselves contenders. What little the Broncos can do about that situation, they did by achieving a bye week for the third year in a row. While the case could be made that it hasn’t helped Denver previously, this year, it represents the best chance that the team has to be complete enough to take on any opponent in the Super Bowl. It’s very rare that a team can improve its position by simply doing nothing, but Wild Card weekend was that rare opportunity for the Broncos to do just that. Denver got an ideal opponent, an even better storyline, and a chance to get healthy. Hope you enjoyed stress-free football Broncos Country. Next weekend will be a whole lot different.